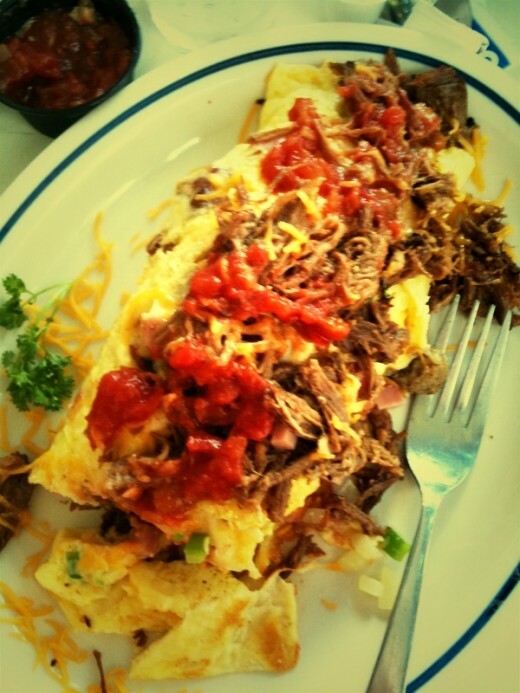 This is a great meaty omelette from International House of Pancakes which contains bacon, sausage, shredded beef, ham, onions, green peppers and cheddar cheese. You can use deli meats to make this dish at home with simple ingredients and limited cooking skills. In a skillet melt butter. Add onions and pepper. In a mixing bowl, add eggs, water and salt. Spray the skillet with non stick cooking spray. Add onions, peppers, tomatoes and all the meats and 1/2 cup of cheese. Fold the omelet in half and top with more cheese. Serve with salsa and or sour cream with a little diced green onion.